Use QuickTapSurvey to seamlessly capture leads and send them to your Infusionsoft account. Use our Infusionsoft survey integration to export leads to your account, include opt-in options for email campaigns, and more. Easily collect leads for Infusionsoft on your mobile phone or tablet. 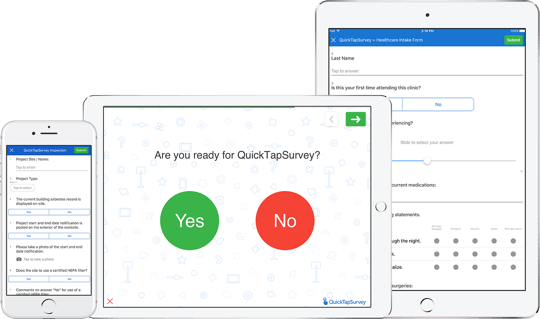 QuickTapSurvey works on all iOS and Android devices. Capture lead data even if you're offline. Your information will be passed to Infusionsoft as soon as you reconnect to the web. Customize the way you collect leads by using a variety of field types, including GPS location, email capture, ratings, and more. Brand and customize your surveys without needing to know how to code. Add your logo, include your brand colors, and more. Optimize your lead nurture by sending out personalized email follow-ups to everyone that completes your lead capture surveys. Don't waste time on contacts that won't bear fruit. Pinpoint quality leads by assigning different scores to each survey response. Turn your Infusionsoft lead capture surveys into contests, sweepstakes, or giveaways with scratch card, instant draw, and more. Set up automated kiosks at events to easily collect leads at your booth. Instant notifications will keep you up-to-date on uptime. Alcatel-Lucent Enterprise used QuickTapSurvey to reduce their lead collection process from 3 weeks to only a few days. Use mobile surveys at your next event to avoid expensive lead retrieval units and scanners. Use a tablet as a kiosk at your checkout counter or front desk to capture data from customers. Attract more visitors to your booth by using your surveys to run a contest or giveaway campaign. Build your surveys from scratch in minutes, or get started immediately with a prebuilt template. Take your Infusionsoft lead capture to the next level. See QuickTapSurvey's Infusionsoft survey integration in action by starting a free trial. No credit card needed.